One of the best things about vacation for me is getting to read. In my old life – pre-kids – I read a lot. Now I have a couple of hours of peace in almost every single one of my days when Graham is in afternoon preschool and Spencer is napping, or – three days a week – when both boys are napping. It has been this way since I had children. I am blessed enough to have kids that sleep at the same time and always have. It is the only way I was able to work as a personal chef for three years and cook and bake all that I have. Because that is what I am usually doing during those hours of quiet house. Cooking. Or baking. And, for the past year and a half of having this blog, writing. Or reading the many food blogs I subscribe to. For five years, I could have been curled up on the couch a couple of hours a day, and reading the many many books I have on my “to read” list. But I have been creating, tasting, making mistakes, and writing about it all. Regrets? No. But I do miss reading. When we go on vacation, I read. Or I do as much as I can. On the plane, in between stuffing my kids with all the snacks I don’t usually let them have, I read. During those precious nap times, because I am not cooking or blogging, I read. I stun myself by how quickly I can devour a book. Especially if it is good. Doubly especially if it is about food. I always promise myself that I will read more when I get home. And then I come back to the two or three month backlog of The New Yorker and dinners to cook, and dishes to do, and blog posts to write. I got to read a couple of books on our trip to Sun Valley, one of which was David Lebovitz’s The Sweet Life in Paris. In addition to writing several dessert cookbooks (including the be-all end-all of books about ice cream), he has written this memoir about living in Paris. In it, he describes many of the joys and frustrations of the city we all dream about. I lived in Paris for four months in 1990 as a college junior and, although so much is different now, I laughed out loud at many of the things he talks about. So many memories came flooding back as I read those pages. But for me, the real treasure of the book is the recommendations of where to find kitchen-related gear in Paris (for a certain, ahem, trip we have planned in June) and the recipes at the end of each chapter. Finding a good simple cake recipe is like finding gold for me. We entertain a lot in our house. The word “entertain” is kind of fussy but it does describe what we do. We do the big Saturday dinner parties with eight people and wine flowing, but we also just often have someone casually coming over for dinner. We like to have people here and I like to feed them. Sometimes it is planned and sometimes it is spontaneous. For all of those occasions, I like to have something homemade for dessert. Yes, I could bake up a batch of cookies, but cookies can be fussy. Individually shaping them and varying baking times make them my not-favorite-dessert-to-make. Cake feels fancy but it doesn’t have to be difficult to make. Actually, it can be so easy. Mix together a batter, pour into a pan, and bake. For me, the problem is when I go looking for a simple cake recipe, I get bogged down with tiered things with frosting and mousses and curds. (I’ve talked about this recently before in this post. Man, that cake was awesome.) Sometimes I just want cake. Well, my goodness – I have gone on and on, haven’t I? Here it is. This is cake. Easy to make, not boring. Stores well, feels fancy on a pretty plate next to some, say, malted milk ball ice cream. Looks like plain old chocolate but take a bite and the lovely variety of spices hits you. Randy says he doesn’t like chocolate (yeah, right) but he loves spice and he really liked this cake. It is Lebovitz’s take on Pain d’Epices and he calls it Chocolate Spice Bread. Apparently in Paris, the non-chocolate version is sold by weight. I don’t remember that from my time there, I think I was too busy tasting every single baguette in the city, but I find that idea charming. 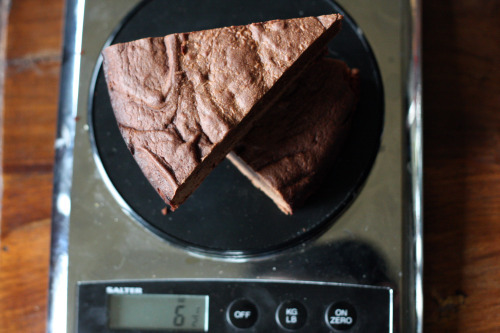 Imagine walking into a bakery and ordering your sweets by the pound! 1. Preheat the oven to 350°F. Butter a 9-inch round cake pan, line the bottom with a piece of parchment paper, and butter that as well. Dust the insides with a bit of flour or cocoa powder, and tap out any excess. 2. In double boiler or a large heatproof bowl set over a pan of simmering water, melt the chocolate and butter together, stirring until smooth. Let cool to room temperature. 3. In another bowl, sift the flour, cocoa, baking powder, cinnamon, ginger, cloves, and salt. Add the anise seeds. 4. In the bowl of a standing mixer or with a handlheld mixer, whip the eggs, yolks, honey, and sugar until thick and mousselike, about 5 minutes on high speed. 5. Fold half of the whipped eggs into the chocolate and butter. Then fold in the remaining egg mixture. 6. Add the dry ingredients one-third at a time, using a spoon to sprinkle them over the batter and folding until the dry ingredients are just combined. 7. Scrape the batter into the prepared pans and bake for 30 t0 35 minutes, until the cake feels barely set in the middle, but still moist. 8. Remove from the oven and let cool for 15 minutes. Tap the cake out of the pan and cool completely on a rack Wrap the cake in plastic and let stand at room temperature for 24 hours to let the flavors meld. Storage: Well-wrapped, this cake will keep for about one week at room temperature, or one month in the freezer. I read that book when it came out and unfortunately I got it from the library (well, the library and reading library books is always a good thing) so it means that I don’t have the great recipes close at hand. Glad you posted this recipe because I do remember wanting to make this one! Glad to hear it’s better than I could have even imagined. I love to read on vacations! Last time I read My Life in France. Perfect vacation book. David’s book is on my to-read list, I can’t wait to get my hands on it. This bread/cake looks terrific! I read food blogs all night long (like right now), but only read books on vacation, why is that? It is mandatory for me to bring 2 bestsellers when we go away (except in Paris of course, who wants to read when you can eat). Hopefully one day I will be at one of those fancy dinner parties! I know what you mean. Sometimes I just want a cake that I can throw together at a moment’s notice. No trips to the grocery store. No hours slaving over a a batch of swiss buttercream frosting that just won’t seem to come together. Just a simple cake. But delicious also (a girl’s gotta have standards). This looks fantastic. I LOVE to read, too. I am glad that you got to enjoy your vacation doing things that you like. This cake looks phenomenal! yum! Sometimes I do wonder how the food bloggers with kids do it all… now I know! I do my reading on my commute every day. I have 25 minutes on the train twice a day and I always get a seat. It’s the perfect time for a book. David Lebovitz is so incredibly entertaining, isn’t he? Sinking into a good book is one of my great pleasures in life, it is so relaxing and satisfying. I aspire to having more dinner parties and friends over for food often! Oh, that looks good- I’ve been meaning to read David’s book but keep forgetting to make it a priority. Next amazon order I do, I’m definitely getting it. PS- I read a cookbook front to back on my last vacation. It’s good reading! I love to read. I try to read at least one book a month. I haven’t read this book yet, but it is on my list. I want to make the cake already! 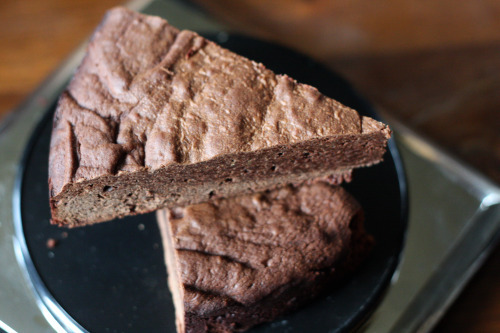 Any excuse to try another chocolate baked goody especially in cake form is good by me. The addition of the spices sounds delightful. jealous of a paris trip!! I too, appreciate a good sweets recipe and love chocolate with spices. Sounds great. I read that book last summer and am now kicking myself KICKING MYSELF for not noticing that recipe, because I could have been making it all winter. i’m such a fan of pappardelle, dana…but good grief – this cake! this cake is perfection. love all the spices, but of course, i love ordering sweets by the pound even more! Here’s to hoping you are able to squeeze in a few more precious reading moments into your day. They’re invaluable! I love the look of this bread! It looks like the perfect texture mmm.